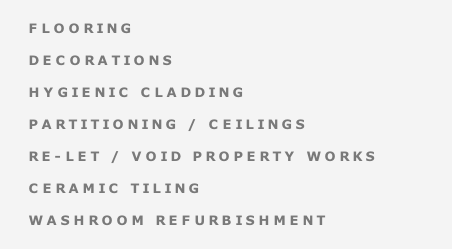 Whether a retail outlet, office or commercial premises, we can help to improve and repair your existing property. Refurbishment may be required to improve your working environment, change it’s existing use, to modernise or simply repair everyday wear and tear. We also carry out re-let works for private and social landlords to ensure properties are let in a good and clean condition, or to help increase rental income. Your requirement may be to update existing decorations or renew flooring only, or further extensive repairs and alterations may be required. Be that partitioning, ceilings, hygienic cladding or a washroom refurbishment, together with all associated trades including lighting or data cabling, we are sure we can assist. Please take a look at some examples in our gallery or contact us with your particular requirements.